I have loved flowers of all kinds since my childhood. 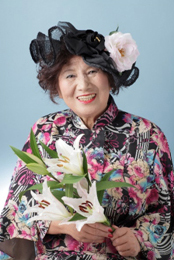 Since I founded Manako Flower Academy 55 years ago, I have had the privileges of communicating through flowers with my Japanese compatriots as well as with foreigners who don't speak Japanese. Thanks to you, members of the Manako Community, the spirits of the Manako Flower Academy and our artistic know-hows are widely spread. 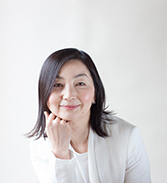 Now, Manako Flower Academy is recognized as one of the avant-garde among the many floral design schools in Japan. We will continue the efforts to keep the lights of the flowers illuminating, with the same tenacity in the future to come. We wish you eternal pleasure and excitement from making the arrangements with your hands as well as holding the beautiful image in your mind. Since birth, I have been blessed to be surrounded by flowers.My grandfather was a florist with his own shop and my father followed in his footsteps. This was how my life long love affair with flowers began.Often coming home from school, I would gaze at the flowers and imagine : "How wonderful if I could be one of them..."
I remember once filling a bucket with buds of Japanese bellflowers which were shaped like little balloons. Of course my father scolded me for cutting off the buds and ruining the stems. I also remember collecting broken flowers, as not to see them wasted, and arranging them with the help of a pin holder which is called kenzan in Japanese. Floral arrangements are often described as mirrors reflecting our feelings and sentiments of the moment. Flowers possess positive energy which can stimulate our five senses, I also feel, everyday, the energy deepening our ties among the fellow arrangers and students. Come discover the charm of flowers and enjoy the magical effects they bring. We are looking forward to sharing the enchantment and fun with you in class.